Once you are done with Pardot Form development, the next step is to build a prospect’s profile with relevant information. This blog is a sequel to my previous blog – How to create a Form that prospects actually want to fill out. In the previous blog, I discussed how to create a simple form using Pardot form builder. The key takeaway of the previous blog was that collecting information is a balancing act – asking too many questions may confuse and overwhelm your prospects; on the other hand, if you ask too few questions, it would hamper your ability to capture necessary information to vet a lead. Progressive Profiling is pivotal in achieving a right balance between collecting relevant information about a prospect without overwhelming them. The profiling allows a user to dynamically frame questions on a form, based on previously provided information by a prospect. For example, if the country selected is United States on a Pardot form, only then, the form will display a Phone field. In this blog, I am going to show you how to get started with progressive profiling using a real-time use case. Progressive profiling a feature that is usually an extension of dynamic form fields. The feature allows you to set up iterative forms that enable you to define which fields appear based on what you already know about a prospect. As a result, every time a prospect fills out a form, you are progressively collecting valuable new information about them while keeping your form as short and easy to complete as possible. In other words, progressive profiling enables you to collect the right information, about your prospects, in a succinct manner. 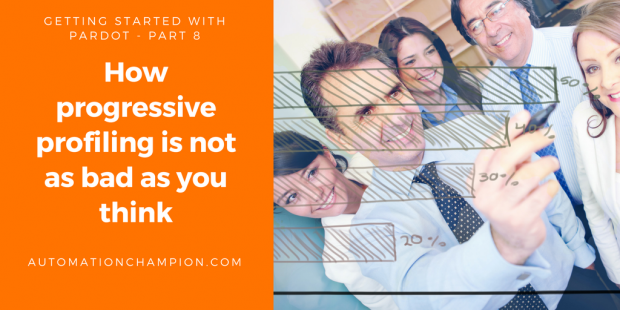 Why is Progressive Profiling beneficial? 1. Shorter Forms has better conversion rates: – Check out this article – Expedia gained $12 million in profit by removing just one redundant field from a Form. The field in question was Company Name. The field was confusing because prospects thought that Expedia was asking for their Bank’s name! Due to the confusion, the prospects entered their bank’s address instead of their home address. The error, in turn, frustrated the prospects because it led to failed transactions. 2. Progressive Profiling avoids repetition: – It helps you to avoid asking the same question again and again. For instance, suppose you have existing prospects who have previously submitted a form (From we have created in last blog post How to create a Form that prospects actually want to fill out) and their primary details are already in your database. If so then, there is no point in asking them to answer the same set of questions every time they download a white paper from your site. By not requesting a prospect to provide the same set of information -that they have already previously provided – conveys to the prospect that you recognize them, and their engagement, with your site; this is a golden nugget/gesture, for it delivers a highly personal user experience! 3. Capture more valuable prospects Intelligence over time: – With progressive profiling, first time when a prospect fills a form, you must can ask the most critical information about them; and then, progressively, you may ask for more detailed information over time as they become more qualified. For example, on a prospect’s second or third visit to your site, you can ask more sales-specific questions, such as Interested in Buying? or What other PRM products are you using? As a result, progressive profiling can even help you shorten your sales cycle. 4. It Saves You Time: – Last but not least, it also save you from creating multiple forms tailored to different landing pages on your website. For example, you might think that someone who ends up on your product pricing landing page is further along in the marketing funnel, and as a result, you might want to display a form that asks some more sales-specific questions. Before going ahead and creating a progressive profiling form, make sure you read my previous blog post How to create a Form that prospects actually want to fill out and create a form as mentioned there. It is also possible to load default data in case of the country drop-down. To do so, click on the Load Default Data button. Once a prospect completes Email, First Name, Last Name and Company fields, the next form they see will a Phone field. Based on your form setting, you have to either wait 10 minutes or you can try submitting a second form without delay. That is it for today. Thank you for reading my blog on Progressive Profiling. If you liked what you saw, then, please do share it with the community. Re-display field that is previously completed. Hey Rakesh, Excellent write- up. In the competitive business environment, only one wins who best understand the needs of its customers and provide exceptional customer experience. Progressive profiling is the best way to achieve this where you get information in bits and pieces.